LinkedIn is an excellent online venue to make new business connections and establish your reputation as a professional. Without a strong LinkedIn Profile, you could be missing out on a lot of opportunities in terms of social networking and outreach. 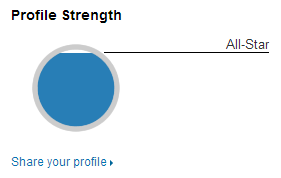 LinkedIn’s Profile Strength meter tells you how complete and robust your profile is. You can find it on the right side of your profile page. If you haven’t completed your profile yet, an “Improve Your Profile” button will appear next to the “Edit Profile” button on your private profile page. This will show you what information is missing from your page. Filling out your LinkedIn profile will make your Profile Strength meter go up, but that doesn’t automatically mean your profile is powerful enough to impress other professionals. Here’s a list of steps you can take to strengthen your LinkedIn Profile. Not having a profile picture will make it easy to dismiss your page as inactive or outdated, but using a candid photo someone took at a Halloween party can be just as problematic. Use a recent, clear, professional-looking headshot to leave a good impression on your LinkedIn visitors. It’s also ideal to use the same profile photo across all your social networks for consistency. Keep your profile updated with the latest information on your career, achievements, notable projects, and skill set. When adding fresh information to your profile, it might be best to turn your activity broadcasts on. This lets your current contacts know you’re taking the initiative to keep your profile up to date. You can turn broadcasts off if you’re only making minor corrections or adding some old information that you forgot to include in your profile. You can also use LinkedIn’s Status Updates to post the latest news about your accomplishments or professional progress, or share any resources or links that your network will find interesting. Your LinkedIn profile needs to be detailed enough to let visitors know who you are as a professional, but concise enough to for them to skim. It’s important to include detailed descriptions and lists of relevant work experiences on your profile, but you need to avoid overloading visitors with information. Focus on highlighting the most relevant work experiences and your top accolades. If it’s been years since you graduated from college, it might not be necessary to list your experience as an intern or working student. 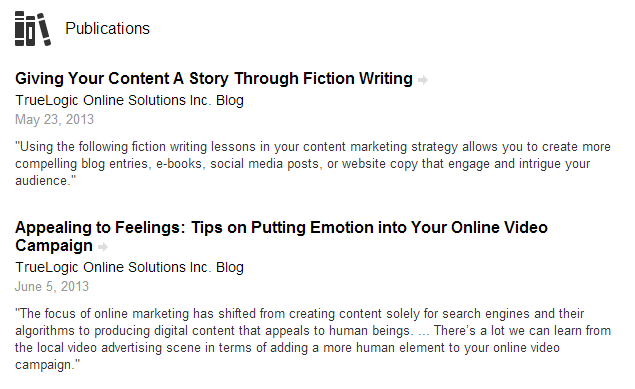 Writing the summary and headline for your personal profile is different from writing them for your company profile. People visit your page to learn more about you as an individual, so don’t be afraid to tone down the formalities a bit and infuse more of your personality into your profile. The same idea applies to your requests for recommendations or connections. Don’t use LinkedIn’s default messages, or copy-paste a template message into every request. Use invitations, requests, private messages, and other forms of communication on LinkedIn to reach out and develop meaningful and lasting relationships with our contacts. LinkedIn allows you to post your published articles, YouTube videos, Slideshare presentations, Behance portfolio, podcasts, and more. Adding samples of your work to your profile is a great way to show people what you can do, and helps you leave an even greater impression on potential employers or business partners. Endorsements and Recommendations are powerful pieces of social proof that reinforce your credibility and establish your status as a skilled professional. Endorsing and recommending your contacts first is the best way to ask them to do the same for you. We’d love to help you create a stronger LinkedIn profile and marketing strategy for your brand. Contact us to find out what we can do for your campaigns on LinkedIn, Facebook, Twitter, and other popular social networks. Born to a family of writers and bookworms, Elrica Gosiengfiao has always been a self-professed geek. She works as a marketing copywriter, but spends much of her free time traversing different worlds through books and games. El also has a background in visual arts and graphic design, and has a love affair with anything art nouveau.